Trader Johns is a fruit stand located in a 2,100 square foot corrugated metal-skinned storage shed near Wenatchee in Eastern Washington State. The building has a main area that is open on one side and a cold room located in the back. Ceramic Insulation Coating was applied to several different areas of this fruit stand to document the heat reduction achieved. Surface temperatures were measured to show differences between CIC Rhinoskin and standard (white & dark) paint over this metal skinned, wood framed building. Two sections of the building were coated with CIC Rhinoskin applied at a thickness of 20mils (0.020” or 0.5mm) on a roof section over the top of a 24’x16’ cold room and also at 40mils (0.040” or 1mm) on the exterior of the sliding door that opens into the main room of the shed. The main room of the shed maintains the ambient 84F and the cold room is just above 42F. 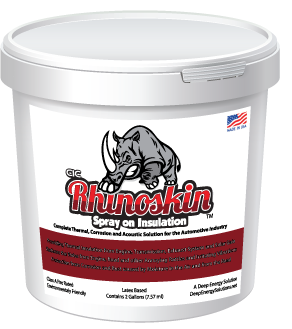 The data collected demonstrated that CIC Rhinoskin was superior white and dark paint and the uncoated surfaces. This photo shows the insulated roof sections at upper left over the cold storage room and insulated door at the right hand side of the frame. The photo shows insulated surfaces on the roof at 76F over the 42F cool room area and at 84F on the insulated door, which represents the ambient temperature. Both insulation coated surfaces’ temperatures show they’re not being radiated and absorbing heat from the sun. Nearby readings on the white painted surface show 90.2F and 93.9F with the red-coated surfaces at 106F to 106.5. 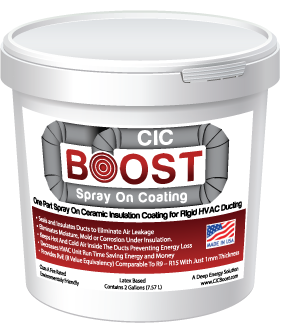 This also demonstrates that white paint absorbs infrared-based heat energy while insulation coating does not. The red painted surfaces, being darker, show their ability to absorb higher volume of infrared energy than the white surfaces. The following photos show the effect of CIC Heat Block applications to the roof. The insulation coated roof section temperature at 76.3F shows that surface is maintaining the cold room’s cooler interior temperature (42F) more effectively. Based on the principal that heat travels towards cold, this shows the ceiling/roof envelope temperature is cooler at the surface and even less than the ambient temperature. Where surface temperatures are over the 84F ambient level, this means metal walls or roofing is absorbing additional heat energy and transferring that additional heat into the building’s interior. 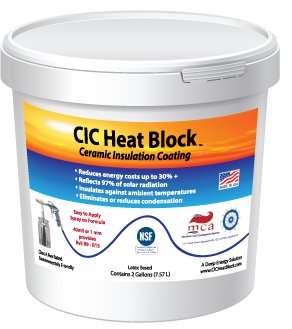 Sidewalls and radiating heat – Surface temperatures on insulation coating compared to white or red colored surfaces clearly show the advantage of blocking solar heat radiation. Insulation coated surfaces maintained ambient temperature and prevented exterior metal siding from transferring additional heat into the interior envelope. Actual differences were 7F-11F degrees between white insulation coating and white paint and 16F-21F between insulation coating and red paint. Interior photo (#3) shows the inside surfaces without insulation coating radiating that additional heat through the metal skin with temperatures of 96.7F. The insulation-coated door on the other hand, maintains the 84F ambient temperature of the buildings exterior and open-to-the-outside interior, showing no sign of solar heat loading. Roof and Solar Heat Loading – The insulated roof section is above the 16’ x 24’ cold storage room that’s maintained at approximately 42F. The coating insulated section’s surface temperature is 76.4F, over 7F below the ambient temperature and almost 13F below the adjacent white-painted section. This shows the insulated roof surface is a) preventing solar heat loading and b) providing additional insulation value to the roof envelope above the cold storage space. The adjacent white painted surface is a) adding solar-based heat load that’s over and above the ambient temperature, into the roof envelope’s existing conventional insulation, where that radiant energy is then stored and b) re-radiating that heat energy into the cold space until it’s dissipated. The process of dissipating the stored radiant heat load takes place even after the sun goes down.